…the usual skirmishing over numbers…any thoughts on the protests overall from around the state? and Ireland to Queens Archives. 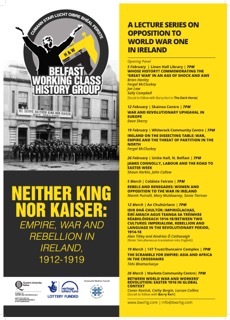 Perrot Avenue, Cork: Booklaunch and discussion. According to this report the CIA has admitted that many sightings of UFO’s were actually of secret advanced aircraft. Posted by WorldbyStorm in Irish Politics, The Left, Uncategorized. Sinn Féin National Chairperson Declan Kearney has welcomed the public support of SIPTU President Jack O’Connor for developing an agreed platform among the left. Jack O’Connor is to set out his position in a speech this morning at Glasnevin to commemorate Jim Larkin. “Sinn Féin called this week, to begin formal discussions between ourselves, progressive independents, the trades union movement, grass roots community organisations, and others on the left in Ireland, north and south. “Therefore SIPTU President Jack O’Connor’s public support for developing an agreed platform among the left is to be welcomed. Mr O’Connor called on social democrats, left-wing republicans and independent socialists to join together on a common platform with the aim of winning the next general election and establishing the country’s first left-of-centre government. This is brilliant – in a way – a fusion of UFO’s, the 1% and secret space programmes. Though if your taste runs in a different direction, what of this, the Nazi Secret Space programme? Between 1982 and 1992, NASA launched 11 shuttle flights with classified payloads, honoring a deal that dated to 1969, when the National Reconnaissance Office—an organization so secret its name could not be published at the time—requested certain changes to the design of NASA’s new space transportation system. The NRO built and operated large, expensive reconnaissance satellites, and it wanted a bigger shuttle cargo bay than NASA had planned. “NRO requirements drove the shuttle design,” says Parker Temple, a historian who served on the policy staff of the secretary of the Air Force and later with the NRO’s office within the Central Intelligence Agency. Just reading the piece it’s perhaps telling that despite the efforts to have a military astronaut corps that project -as far as we know – fell apart with only a handful of those selected for it ever flying with NASA supplying astronauts to do secret missions. In a way one suspects that was a product of the contradiction, given that many of NASA’s astronauts were were from military backgrounds themselves. Why duplicate the resources? Furthermore it’s clear that almost from the off the military were utterly unconvinced at the arguments for manned spaceflight. Unmanned launchers served their purposes as well or better. By the time of the Challenger disaster the military had withdrawn and handed over responsibility for classified missions to ‘ordinary’ NASA crews of astronauts. By the way, interesting too to read that it was the Soviets who offered some insight into what might be going on, even if what they knew was limited and slanted itself one way or another. Thanks to Garibaldy for pointing to these anti-Free State caricatures and cartoons! Facsimilie copies of seven sheets of hand-drawn caricatures, each one featuring a grotesque satirical portrait of a figure from the Free State Government. Abstract: The Samuels Collection consists of printed ephemera of the 1916 Rebellion, World War I, the War of Independence and the Civil War. It was gathered in part by the Royal Irish Constabulary, and collected by Arthur Warren Samuels, Solicitor General for Ireland (1917-1918) and Attorney General (1918-1919). It was presented to the Library in the 1960’s. I’ve got to be honest, I’ve always more admired Sleater-Kinney than much liked them. And yet, on paper, I should. They have forged an enjoyably rickety approach to rock inflected by punk and new wave. They worked with the Go-Betweens in the early 2000s on their The Friends of Rachel Worth. They’ve been solidly feminist and progressive. They’ve been unbelievably busy both in music and some in television and so on. And yet, while liking everything I read about them, and everything they said, the actual music just didn’t connect – it was just that bit too abrasive to my ears. But their latest album, released this month, while equally abrasive is making me reconsider their earlier material with fresh ears, because it is, and I don’t think it’s too early to suggest this, something of a masterwork. It starts as it means to go on with the scattered melody and instrumentation of Price Tag – a witty but heartfelt and thoughtful reflection on contemporary capitalism. Yes, it’s that sort of an album. The song is monstrous, huge guitar sounds, driving percussion, impassioned vocals, that combine to offer a claustrophobically vision of greed and consumerism. And yet, the claustrophobia is lyrical, more than musical. And on it goes, Surface Envy, all skittering guitars – almost no medium paced or slow tracks on here. All to the good, that. Curiously disjointed arrangements, fantastic choruses, quiet moments that intersperse the oddly metallic sheets of sound. Single No Cities To Love, sounds like Television and Slits meeting Sonic Youth, and yet remains entirely their own track. Indeed it’s the ability to merge post-punk, something close to grunge and a defiantly modern sensibility that makes this such a pleasurable and challenging listen. Other highlights include the almost anthemic A New Wave, the jagged (ironically titled) No Anthems, the off kilter chugging of Gimme Love, but they’re all good. Enjoyable, thought provoking. What more could one ask for from a group that is already two decades and more old. More than well worth a listen. …only got a minute, so I’ll keep it short. I’m unable to understand how the Ceann Comhairle can criticise Fianna Fáil for seeking to undermine him in relation to his ruling that there would be no Dáil debate on the creation of a commission of inquiry into allegations about the Garda when not a few days back the Deputy leader of the Labour Party was as far as can be determined raising questions as to the constitutionality of the CC’s approach? How can one be undermining and not the other? “Alan Kelly had no business saying what he said because he didn’t know the facts. And I made it clear to the Tánaiste yesterday that I objected to that remark. “Of course [the main Opposition parties] they are [out to undermine him], it’s perfectly obvious. Because this is no business of plain politics, this is a unique situation where a deputy who was minister for justice has a case pending in the High Court, and who has already through his solicitors sought from me and from the Government to have his name deleted from the terms of reference. 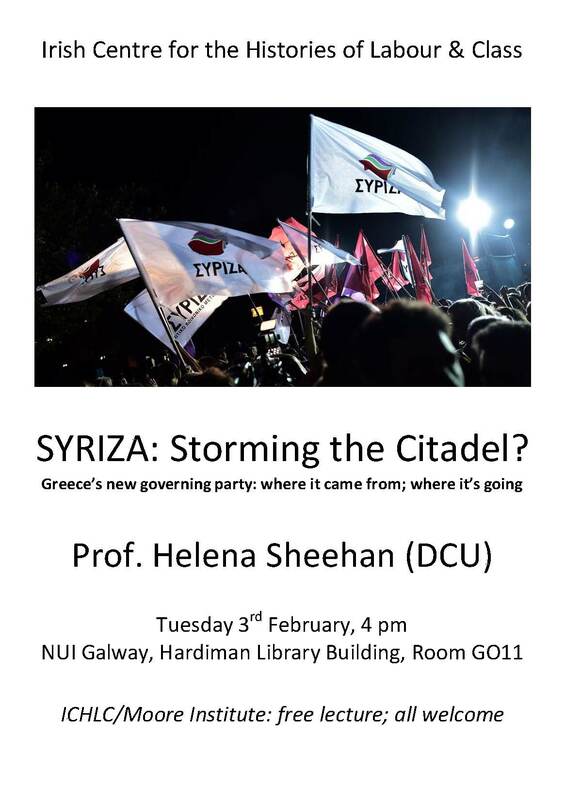 The Irish Centre for the Histories of Labour and Class (ICHLC) is delighted to host a public lecture by Prof. Helena Sheehan (Emerita DCU) on ‘SYRIZA: Storming the Citadel? Greece’s new governing party: where it came from; where it’s going’. Prof. Sheehan will discuss the origins of Greece’s new governing party, its policies and perspectives – and its prospects. And more in February and March!